Jungle Jim is an online video slot machine game released in May 2005. It is offered exclusively at online casinos powered by Microgaming. This online video slot game has 5 reels and 15 pay lines. The theme of Jungle Jim is inspired mostly by the escapades of Steve Irwin, nicknamed “The Crocodile Hunter”. He was an Australian wildlife expert, a conservationist, and a TV personality. Most people are naturally afraid of crocodiles, alligators and other wild animals living in the jungle, but thanks to Steve Irwin and his educational shows, a lot of us were able to understand better how and why reptiles and other wild animals behave the way they do. Many players say that they liked the overall nature atmosphere of this game, and even if we still have that natural fear instilled within us when it comes to gators, you will surely be watching out for the Gator Bonus symbol as 3 or more of them can reward you with nice payouts! Microgaming online slot games are available to players in 2 formats – download and no-download. Whether you like to download their software first or you prefer to play instantly without the need to download, then Microgaming surely has online slot machine games to accommodate your each and every slot gaming needs. Good thing that Jungle Jim is available for instant play, so you do not have to download anything to find out if this game interests you enough in a way that you would like to spend some real money on it. Jungle Jim is an excellent starter game for newbie online slot players who are looking for action-packed reels! Even seasoned players love to play Jungle Jim as it offers fantastic rewards and an overall easy game play. The Jungle Jim online slot game features scatter wins, a wild symbol, a Gator Alley Bonus Feature game that can reward you with up to 10 Free Spins with up to a 5x multiplier, a Free Spin Bonus Feature game, a maximum coin jackpot of 7,500, and a maximum cash jackpot of $20,000! Microgaming provides top notch quality of graphics and sounds when it comes to any of their online slots games. They make it a point that their online slots games have the most stunning graphics and realistic sound effects that will take their players to the world of slots games and their particular themes. Many players like to play online slot games that are run by Microgaming because they always have nice animation and interesting yet non-intrusive sounds. In Jungle Jim, players get to explore the thick jungle with Jungle Jim, an elderly man (his professor), and his assistant (Susan). The symbols are drawn nicely, are colorful, and in perfect detail. Simple animated programming is used on the symbols when you successfully manage to get winning combinations. 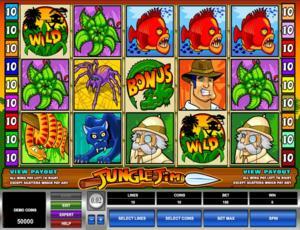 The overall graphic design of Jungle Jim shows the reels to have a green, leafy background, clearly depicting the thick jungle where the wild animals of this slot game reside. You will see on the game logo a sharp-tipped spear that may be used by a native tribe. The colors used are red, purple, green, blue, yellow, brown, pink, orange, black and white. The constant background sound effects you will hear in this game are chirping birds and sounds made by other animals such as jabbering monkeys and singing insects. When you spin the reels, jungle-themed music is played out. When you form winning combinations, “blinking” sound effects will be played out. There are no card deck symbols available in the Jungle Jim online video slot game. The regular symbols that you will see in the Jungle Jim online slot game are: the Piranha, Man-eating Plant, Giant Spider, Snake, Panther, Susan, Professor, and of course, Jungle Jim himself. The Wild Symbol is the Tree House. The Tree House wild symbol acts as a substitute for all other symbols (except for the Scatter symbols) in order to help you form winning combinations. You are paid varying prize amounts (refer to the Payout table) when you manage to form a winning combination with multiple Tree House wild symbols on an enabled pay line. In Jungle Jim, there are 2 Scatter Symbols – the Target and the Gator Bonus scatter symbols. The Target scatter symbol does not need to appear in a line (on an enabled pay line) for you to win. • The Target scatter symbol can be scattered anywhere on the 5 reels for you to complete winning combinations, as long as there are 3 or more Target scatter symbols that appear. Your winnings are calculated by multiplying the Target scatter symbol combination payout (refer to the Payout table) by the total number of coins you’ve bet. Please take note that if you get a scatter win and a regular win, then you are paid out for both of these wins, because the Target scatter symbol is not required to come out on an enabled pay line for you to win. Scatter awards are independent from pay line awards, thus they are added to the pay line win. • The Gator Bonus scatter symbol can be found scattered anywhere on the reels, but they must appear from left to right in consecutive order, and on an active pay line for you to win. If you hit 3 or more Gator Bonus scatter symbols (anywhere on the reels in consecutive order and on an active pay line), you will activate the Gator Bonus Feature game. Please take note that if you get a scatter win and a regular win, then you are paid out for both of these wins, because the Gator Bonus scatter symbol is not required to come out on an enabled pay line for you to win. Scatter awards are independent from pay line awards, thus they are added to the pay line win. If you manage to get 3 or more Gator Bonus scatter symbols (found anywhere on the reels) in consecutive order and on an active pay line, you will trigger the Gator Alley Bonus Feature game. In the Gator Bonus Feature game, you will be presented 5 different Alligators that give out varying Free Spins and multiplier amounts. Simply choose an alligator to give you Free Spins, and choose another one to give you the Free Spin multiplier amount. Up to 10 Free Spins, with up to a 5x multiplier amount can be won in the Gator Alley Bonus Feature game. Once the Gator Alley Bonus Feature game is over, you will be taken back to the main Jungle Jim online slot game, and your Free Spins will be played out automatically. Once the Gator Alley Bonus Feature game is over, your Free Spins will be played out automatically. All of the winning combinations you hit in the Free Spins will be multiplied by the multiplier amount you got from the Gator Alley Bonus Feature game. You are rewarded a guaranteed win for each Free Spin that does not garner a winning combination. The calculation for the guaranteed win (in credits) is: (the number of coins you’ve bet per line) x (the Free Spin multiplier) x (the coin size you chose). You cannot re-activate the Gator Alley Bonus Feature game while playing the Free Spins. Once the Free Spin Bonus Feature game is over, you will be then taken back to the main Jungle Jim online slot game, and your winnings from the bonus game will be included to your win total. Jungle Jim has 5 reels where you may bet on as many as 15 pay lines. The minimum bet is 0.01 and the maximum bet is 0.50 per pay line. You can wager from 1 up to 10 coins per pay line bet. Therefore, the maximum bet amount is 75.00 per spin. Please take note that the amounts indicated are in Pounds, but they will remain the same if you choose to play in US dollars, Euros, or Canadian dollars. Also, for every coin that you wager, you will enable another pay line. You will be paid out for winning combinations on enabled pay lines only. The maximum payout in the standard Jungle Jim online video slot game is 4,000 coins per line bet. Those who frequently play online casino games obviously love to stay longer on online slot games that have an Autoplay function. Good thing that Jungle Jim comes with this helpful function! In Microgaming online slot games, they have 2 game modes – Regular mode and Expert mode. You can have the game spin automatically for you with the Autoplay function that can be found by clicking the Expert button (located at the lower left portion of the game screen). After customizing the Autoplay function to your preferences, just click on the Start button, and the game will automatically spin for you while you just sit back, relax, and enjoy playing this nature-inspired online video slot game!